It isn’t a technology solution. It is decidedly low-tech. It’s not a medical device, but it does ease suffering. And while we sometimes joke about hoarding, older adults are buried in stuff — the accumulation of a lifetime (or two). The resistance to letting go of it is an enormous issue for caregivers, senior living providers and aging in place experts. Of all of the issues of caregiving, this one is the gift that literally keeps on giving. My mother, whose basement was nearly at intervention stage, had a fire and her house burned down. She lost everything, but continues to joke that she saved us from the work of going through that stuff. The positive outcome was that she and my stepfather moved to a very livable, beautiful home in an age-targeted community with plenty of features for aging in their home. In our research with family caregivers, it isn’t medication management or fall prevention that keeps them up at night, though they care deeply about those things. It is their worry over what to do with all of their parents’ stuff. The conversations with their parents can be as precarious as the “time to give up the car keys” talk. At a time in their life when seniors are losing friends, giving up hobbies and freedoms, their treasures are very important. The irony is that seniors believe staying in their homes as long as possible is easing a burden on their children. The reality is that it shifts the burden from the finances of long-term care to extended time and expense of wrapping up their affairs after death. Senior housing professionals know that stuff keeps older adults from moving to homes that are better designed for their needs — both physical and social. Aging-in-place professionals and occupational therapists know the dangers all of the stuff creates in the home. Caregivers tell us that the aftermath of losing a loved one is so complicated by the dispensation of stuff that their mourning and grief is put on hold sometimes for several years. Two-thirds of 18-34 year olds value experiences over possessions. They don’t value or want the stuff. And if HGTV is any indication, they are buying tiny houses with the storage capacity of a file drawer. That’s if they can afford to buy a home at all. Perhaps it’s growing up with the stuff that has created this desire for a simpler existence. There are 50,000 storage facilities in the U.S. — five times the number of Starbucks. That’s 2.3 billion square feet. 50% of storage renters are simply storing what won’t fit in their homes even though the average home size has doubled in that last 50 years. It seems everywhere you turn these days there’s some new diatribe against the generational focus of commentaries on society. It’s boomers attacking millennials attacking boomers… Heck, we even played an April Fool’s joke based on the trend a couple of weeks ago. Are your ideas of grandparents woefully outdated? Photo: bandini, Morguefile. Multi-gen housing as a temporary reaction to recession. Bitter, who was raised by her grandparents, points out that humans have been living with several generations under one roof since the beginning of civilization, and in many cultures around the world, it’s more common than it currently is in the United States. But as we become increasingly multicultural, it’s important to examine our biases and look at the facts: 2.7 million grandparents are raising small children on their own, and that doesn’t encompass the many who are sharing the task of raising children with the kids’ biological parents. She also points out that, far from being temporary, the trend will probably grow as people are living longer, and notes that grandfamilies occur in every area of the country and represent all income levels, races, and ethnicities. Midlife crises. Rather than fearing their advancing age, boomers are becoming less concerned with numbers as they mature. Bitter says this is the beginning of wisdom, or “the centered sense of the timelessness of all things.” She suggests thinking of marketing in the same way you might universal design: If you create something that can be used by anyone, it will be appreciated by everyone. Now that’s a stereotype I think we can all live with. A lot has been written about Baby Boomers, who are doing a lot more to boost the economy than they are given credit for — a lot more — says author Lori Bitter. 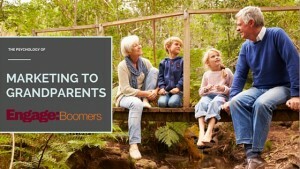 Bitter, author of “The Grandparent Economy: How Baby Boomers are Bridging the Generation Gap,” says Boomers are not only taking in their parents, but sometimes several generations of family members who have not recovered from the Great Recession. The problem, she says, is that they are doing it all at great peril to their own retirement. “The real story is they may have two or three generations of people living in their homes that they were working their butts off to support,” she says. “This generation just gets bashed. When you see what is really happening. It is more interesting that the headlines and misunderstood labels. Not only are they endangering their own retirement by supporting family members, but they are also doing it at the expense of their own health, she says. Plan to attend the longest running Venture event focused on the baby boomer consumer and the longevity marketplace. This year’s theme is Strategic Investment in the Longevity Market. It will be hosted on Wednesday, June 22nd, 2016, 9:00am – 6:00pm, at Santa Clara University, in the Music and Dance Building, Recital Hall. Ken Dychtwald, visionary thought leader and author, will keynote this year’s Summit. This year’s agenda features invitation-only Bootcamps the day before the event, plus a Breakfast with Angel Investors with a research briefing early in the day. Favorite sessions, Pitch for Distribution, and Investment Priorities are featured, in addition to a new session titled “Elements of Success” featuring: Ted Fischer, Vice President, Business Development, Hasbro; David Inns, CEO, GreatCall, Inc.; Andrew Gordon, Directing Animator, Pixar Animation Studios. Click here for more details and the full agenda. 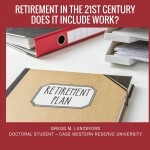 What is Retirement in the 21st Century – Does It Include Work? In 2011 America’s Baby Boomer’s began turning age 65 a rate of approximately 10,000 people per day[i]. Historically age 65 has been the milestone at which many people retire. Dictionary.com defines retirement as “the act of leaving one’s job, career, or occupation permanently, usually because of age”. This classic definition was more appropriate when retirement systems were created in the early 20th century to provide income for aging employees with diminishing work skills. When the Social Security Act of 1935 was drafted the average life expectancy for men and women were ages 58 and 62 respectively[ii]. By 2013 the average life expectancy for men and women in the U.S. increased to ages 76 and 81 respectively[iii]. Our increased longevity and improved health now allows for a wider range of lifestyle options therefore retirement is taking on new meaning. For many, retirement has become a career transition that includes work on different terms in the same profession, or the beginning of a new career[iv]. Work with flexible structures has led to “win-win” situation for retiring workers and employers as they recognized several benefits from working beyond retirement age. First, many individuals benefit from the socialization and feelings of accomplishment that come from work. Forty percent of individuals who completely retire from the workplace suffer from clinical depression and 6 out of 10 report a decline in health[v]. For many, work provides an outlet to continue to thrive and improve their well-being. Second, working in retirement allows many employers to maintain valuable knowledge individuals have developed over 30-40 year careers. Such individuals are often valuable mentors and can assist with succession planning and the training of younger employees in the workforce. Finally, Baby Boomers represent the largest cohort in the workplace. The complete exit of all them from the workforce at age 65 has the potential to create a human resource gap and limit overall productivity. The retention of Baby Boomers may help many organizations improve their productivity and become more competitive. Given the overall benefits, it is important that society better understand what factors may predict an individual’s intent to work in retirement. In 2015, a study was conducted on retirement work intention[vi]. In the study 227 working individuals, of which 93% were age 50 or older, were surveyed to see what factors contributed to their decision to work in retirement. Our research showed that a person’s confidence in their ability, willingness to be adaptable and belief that they will have meaningful opportunities for work in retirement were all predictors of their intent to work in retirement. Retirement has evolved and no longer means the complete exit from the workforce. Work with flexible options is becoming a rewarding lifestyle option for many retirees. Careful reflection on what activities will provide happiness and fulfilment should be considered in the retirement planning process and may lead to greater success in retirement. [i] Synder, M. 2010, December 30. In 2011 The baby boomers start to turn 65: 16 statistics about the coming retirement crisis that will drop your jaw. End of The American Dream [online]. [iv] Kim, J. E., & Moen, P. 2001, June 3. Is retirement good or bad for subjective well being. Current Directions in Psychologicial Science, 10: 83–86. [vi] Lunceford, G. M. (2016, January). Retirement Values: What Factors Influence the Decision to Work in Retirement. Unpublished Doctoral Study at Case Western Reserve University . Cleveland, OH. Gregg Lunceford, CFP® is a 24 year veteran in the financial services industry. Mr. Lunceford specializes in wealth management and works with clients on financial, estate and retirement planning issues. 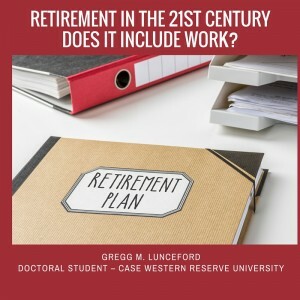 He currently, is a doctoral student at Case Western Reserve University in Cleveland, OH, and is studying how individuals make career transitions to retirement. Mr. Lunceford holds a MBA from Washington University in St. Louis, and a BBA from Loyola University of Chicago. Join me in Washington DC for the 2016 What’s Next Boomer Business Summit: Seizing the Opportunity in the Longevity Economy. As Co-Producer of this year’s event, I can tell you that the sessions and keynotes have never been better. You don’t want to miss this opportunity! This year’s event will be held on Wednesday, March 23, 2016, from 8- 6 pm at the Omni Shoreham Hotel – Washington, D.C., Shoreham Lobby Level (East Side) – Blue Room. Keynotes include: Jo Ann Jenkins, CEO, AARP; John Zogby, Founder, Zogby Analytics; and Rohit Bhargava, Founder & CEO, Influential Marketing Group. With more than 20 sessions to choose from, there is are many opportunities to learn, network, and make a deal with a potential partner. Check out the agenda. To learn more about sponsorship, contact Mary Furlong at: furlong@aol.com. Barry Robertson blogs at 15th Nation and is the co-founder of J.D. Power & Associates. Let’s just say he knows quite a bit about the automotive industry and what’s new. 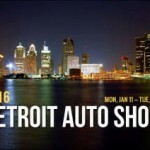 We have reprinted here, with Barry’s permission, his review of the 2016 Detroit Auto Show. And we appreciate his nod to my recent MediaPost blog! After a U.S. sales record of 17.5 million new light duty vehicles in 2015, the automotive press was bedazzled – understandably – by the gorgeous array of new vehicles on display at the 2016 Detroit Auto Show. In an obligatory nod to the upcoming submersion of the Maldives and Manhattan – Trump Tower may soon install a boat dock at the 3rd floor level – manufacturers also featured some exciting new fossil fuel savers. The 200 mile range, all-electric Chevy Bolt took center stage in the skip-the-gas-station department, but our personal favorite was the rather more, er, idiosyncratic Elio Motors P5. At $6,800 and claiming 84 mpg, we’re talking big time green savings, both personal and planetary. And, while lacking the steampunk panache of the Morgan Aero three-wheelers which – equipped with a rowdy exterior V-twin motorcycle engine – terrorized English country lanes in the 1920s and 1930s, it has serious geek street cred. All this emphasis on reducing fossil fuel use coincided with U.S. gas prices well below $2 for a gallon of regular (Gas Buddy). Adjusted for inflation, $2 is the equivalent of 33 cents in 1970 – less than the actual average of 35 cents that year (Energy.gov) when many young Boomers were already driving. Superficially, these low fuel prices contributed to a 5% drop in “electric” vehicle segment sales versus 2014. But a closer look shows battery-only units (BEVs) – sans gasoline aids of any type – actually grew by 8%, from 67,700 to 73,200 (Inside EVs). In reality, it was plug-in hybrid (PHEV) and range extender model sales that fell – by a whopping 22%! Purists may groan, but these models are lumped into the EV category –and qualify for tax credits – because they eke out a few precious miles of battery travel before those pesky fossil fuels (yuk!) come to their rescue. The 2015 decline of PHEVs mirrors a 15% drop for regular hybrid sales. With the arrival of a dozen or so new BEVs, hybrid technology’s green cachet has waned and, yes, lower gas prices have further eroded the appeal. For now. Time will tell. OPEC too. Analyzing the patchwork of micro-niche, eco-enthusiast models that make up the tiny BEV market requires a magnifying glass and a Captain Midnight decoder ring. Forced to build them – and to publicly pretend they really, really want to – until Tesla’s breakthrough, automakers weren’t exactly falling over one another to serve an unprofitable market sliver. One thing is certain, with government policies and much C Suite face on the line, BEVs are here to stay. The key question for automakers is: do you want to sell more? For those who answer “yes” the Boomer-Plus buyer is crucial. More than half (53%) of early Tesla S buyers were over fifty, as were 43% of all BEV buyers through 2013, an era dominated by the Millennial-friendly Nissan Leaf (source: Edmunds.com, Experian). With Leaf’s huge 2014-2015 sales decline (30,200 to 17,300), and major growth by Tesla S and BMW i3, we now figure the BEV buyer median age at fifty-something. Far from needing to save money on fuel, BEV buyers are well-healed. Research firm Strategic Vision tells us the median income for early Tesla S buyers was over $290,000 and TrueCar.com reports medians for early buyers of Ford Focus EV ($199,000) and Fiat 500e ($145,000) were way higher than among the proles who buy the gasoline versions ($77,000 and $73,000). Even the admirable new 2017 Chevy Bolt, lauded by WIRED as “the first true mass-market electric car” costs $37,500. In order to benefit from the Federal tax credit of $7,500 and get the net price down to a ballyhooed $30,000, we figure buyers/lessees will come from the top 15% in terms of income/assets. Not exactly mass-market. Eventually, with more improvements in range, BEVs will move out of the visionary stage. But older, more affluent buyers – that would be us, the over-the-hill, fifty-plus crowd – will remain the dominant generation. Silicon Valley aside, most Millennials don’t have enough money and typical Gen Xers are struggling to raise families and put their kids through college. So expect a continued skew to the 50-plus arena – the owners of around 80% of U.S. household net worth and buyers of half the nation’s new light duty vehicles. It’s not just about demographics: to the chagrin of Madison Avenue’s Millennial-obsessed, 18-49 demo fetishists, the Boomer-Plus consumer, born 1940-1966, is just about the most adaptable on the planet. First, we’ve been adapting – and early-adopting – all our lives; we’re really good at it. We propelled import car brands past the Detroit nameplates our parents loved. We mainstreamed light trucks, SUVs and CUVs into market dominance. 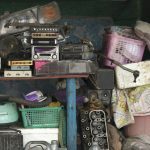 We were the first to jump aboard hybrids and BEVs – remember EV1? At 94 million strong – a population bigger and far more affluent than any European country – the Boomer-Plus Generation is destined to drive the BEV marketplace past the tipping point. Brands serious about realizing EV profits, not just satisfying regulators, need to plug into the 50+ space before their competitors do. We can help spark the conversation.